timing of this dish could not have come at a better moment. The original inspiration for the recipe has been literally laying about my kitchen for a few months, a soba noodle label from a prepared foods container; The ingredients were readily available in my kitchen; a version of this recipe also appeared on a TIVO taped episode of Martha Stewart. All signs pointed to - MAKE THIS SALAD! This is an easy, tasty and versatile recipe. It was so simple, that I could almost say you could get away with 3 ingredients to make it: Soba Noodles (or any type of thin, preferably Asian, noodles); A sesame dressing (or make your own, following my recipe); A bag of Broccoli Slaw mix. We could make it 4 ingredients - adding some shredded sushi or seaweed wrappers but that might scare some of you - so I'll say that's completely optional gilding. The recipe version I've written can be modified - my favorite style. The dressing I made is another variation on my Essential Soy Dressing Sauce, about which I've blogged before. Feel free to use whatever dressing you want; you can add peanut butter to the dressing for a satay style version; chop, prep and julienne your own veggies; add tofu, chicken, shrimp, or whatever protein you desire. It's a starting point, open to interpretation. The most important things are to try something new, experiment, and learn to eat and purchase less processed foods - in the long run, you will be eating healthier. Mix, whisk or shake all the ingredients together in a small mixing bowl or in a tightly covered jar or salad shaker. The dressing will keep, covered and refrigerated for up to two weeks. Bring a large pot of water to a rolling boil. When the water is boiling, add two tablespoons of salt, preferably kosher salt, to the pot. Add in the Soba Noodles and cook according to package directions, about 8 to 9 minutes. When noodles are cooked, but have a bit of bite to them, drain and rinse under cold water. Shake to rid the excess water. 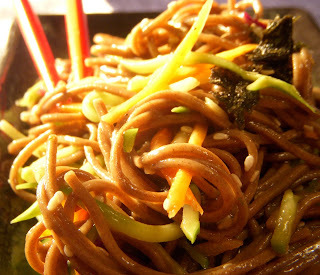 In a large mixing bowl, toss together the cooked soba noodles and the package of broccoli slaw. Pour the sesame soy dressing over the noodles, stirring to combine. Sprinkle in the sesame seeds and garnish with the shredded nori, if using. Chill well before serving. Makes 6 to 8 servings as a side salad.